Bryson DeChambeau won the Memorial; are you a fan? Bryson DeChambeau won the Memorial on Sunday for his second PGA Tour victory. His single length irons, quirky swing and exhaustive pre-shot analysis have become the subject of much discussion since he burst on the scene as an amateur champion. Are you a fan? Jim Deeks, Fairways Magazine (@jimdeeks): I’m not NOT a fan, but I don’t have a lot of respect for guys who can’t just take ten seconds to figure out the variables, then get up and hit the damn ball. I do like the fact that he’s got some quirks, like Trevino and Azinger and Furyk and others over the decades. But get a move on, man! Michael Schurman, Master Professional / Life Member, PGA of Canada: Only one person actually figured out the swing in a scientific manner (Homer Kelly) and only two people figured it out for themselves (Ben Hogan and Moe Norman). Others found a way to swing so they could play but those two were masters of their information. How a person chooses to play doesn’t bother me as long as they play within the allotted time. I wish the TV coverage showed other players during DeChambeau’s discussions so people don’t get the idea they need to emulate him. Dave Kaplan, Freelance Writer (@davykap): I am a Bryson fan. He does things a little differently than everyone else on tour and serves as a perfect example of how there isn’t only one way to swing a golf club. Plus, it looks like he’s starting to get pretty comfortable on the PGA Tour. In just his second full season on the circuit, DeChambeau currently sits in 4th place in the FedEx Cup standings thanks to this most recent victory and five other Top 5 finishes this year. The ceiling looks to be mighty high for the Californian. TJ Rule, Golf Away Tours (@GolfAwayTJ): Being an engineer myself, I do appreciate the scientific angle that he takes towards the game and he certainly is unique in that sense. However, I just can’t be a fan because of how long he takes to play the game. I mean, it took him and Cantlay 5.5 hours to play as a two-ball on Sunday! That’s insane! That’s such an important factor for me when deciding what players I enjoy watching. You have to respect how much he has accomplished in a short time on tour, but until he speeds up his pace, count me as a non-fan. Hal Quinn, Freelance Writer, Vancouver: Not a fan of the talking heads incessant “Gee, he’s smarter than me” schtick. Almost everyone is! We know that! And not a fan of his over-wrought analysis of the minutia not kicking in until his playing partner has finally hit his shot (after mouth-breathing pedestrian computations, however time consuming). How can anyone be a fan of his agonizingly slow and detailed pre-shot crap before flailing back-to-back 9 irons into position Zed from position A? Nurse! 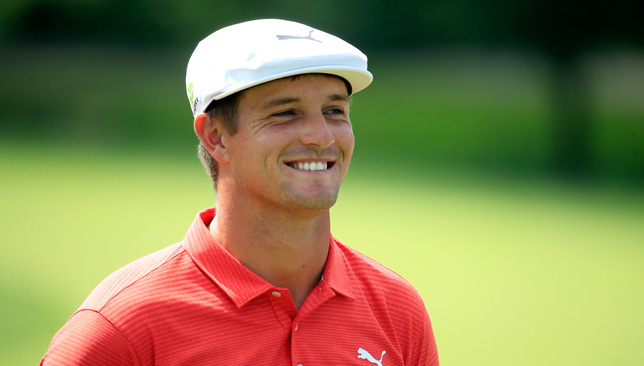 Peter Mumford, Fairways Magazine (@FairwaysMag): I have no problem with DeChambeau’s quirkiness and enjoy his explanations. However, I find it hard to watch him play. He takes so long to hit a shot and seems to weigh so many variables that it makes me squirm in my seat. I start yelling at the TV. That’s not good. The U.S. Women’s Open was played on a wet, soggy Shoal Creek course last week and the USGA decided that despite the conditions, all competitors would play the ball down, as they have for every Open in their history. Do you agree or should unusual conditions allow for some leniency to eliminate the unfairness of occasional mud balls and horrible lies? Schurman: The first Rules of Golf were written in 1744. Rule #10: if a ball be stopp’d by any Person, Horse, Dog or anything else, the ball so stopp’d must be play’d where it lyes. We’ve come a long way since but part of the game is the unknown provided by nature. This isn’t snooker, tennis, baseball, football, soccer etc. This is you against yourself and the elements relative to the other competitors. Kaplan: I think they made the correct call. Majors and lift, clean and place rulings just don’t mix in my book. Majors are supposed to be gritty slugfests with thick rough, unfavourable lies, bad breaks and high scores. So I am all in on players being forced to strategize around wet conditions and muddy balls when there is a major on the line, even if the field is upset about it. Rule: It’s a fine line with any tournament. When does it become unfair? Especially in a major tournament, they like to protect the score, and putting a ball in the players’ hands makes the course so much easier, and puts too much of a premium on hitting fairways in my mind. Until the point that the ball is plugging regularly in the fairways, I say play it as it lies! Quinn: Didn’t seem to have that much of an effect. They were playing in less than six hours. When the USGA makes decisions like this, it’s hard not to visualize the dandruff on the blazer shoulders. There are honourable traditions, and playing it down despite the reality of the conditions is not one of them. Mumford: I thought the idea of a national championship was to identify the best golfer, not the luckiest one. It’s one thing to endure odd bounces and unpredictable influences based on rub of the green but playing the ball down in mucky conditions introduces a massive element of unfairness. Accuracy with a mudball is not one of the skills the USGA should be trying to identify. We won’t ask you to pick a favourite yet but a lot of people are suggesting that this year’s U.S. Open at Shinnecock is more open than usual since there doesn’t appear to be a favourite or even a group of leading contenders. Many of the top ranked players have been inconsistent (McIlroy, DJ, Thomas) and several have been MIA of late (Spieth, Reed). Do you see next week’s major as more wide open than usual or will the top ranked players figure out a way to get into contention for the final round? Deeks: The cream usually rises to the top in the majors. Trouble is, there’s so much cream these days. So, in the top 10 on Sunday afternoon at Shinnecock, I see five “elite” players, and five guys you might not have expected to be there. But don’t ask me who wins, yet. Schurman: Shinnecock Hills is a magnificent course to play. (Twice for me). There are two sayings about the US Open that will describe this Open: the USGA does not wish to embarrass the best players; only to identify them. And, second, you don’t win the US Open; it wins you. One of the best ways to predict a winner is to analyse the stats, place your bet and then throw a dart at the list of competitors for your dark horse. According the most recent PGA TOUR stats: #1 in driving straightness – Henrik Stenson, #1 in shots over 200 yards – Henrik Stenson, #1 in shots from 175 to 150 yards.- Henrik Stenson, Scrambling from 10 to 20 yards. #1 – Henrik Stenson, 3 putt avoidance #7 – Henrik Stenson and Strokes Gained Putting, #33 – Henrik Stenson. Sounds like my #1 pick. My #2 is Rose and my dark horse is Alex Noren. But in answering the original question this isn’t a course where a Francis Ouimet story is likely but then neither was The Country Club in 1913. Kaplan: The majors in the men’s game have been wide open for several years now. In fact, each of the last nine majors have been won by different players. And in eight of those instances, the victor was a first-time major champion. You could easily make a good case for just about any of the top 30 players in the world right now winning at Shinnecock. And even still, it is almost a guarantee that some player you’ve barely heard of before and some old crafty veteran will both come out of the woodwork to make runs at the trophy. Rule: It would certainly seem to be wide open at this point, but let’s be honest, in 99% of majors, the cream eventually rises to the top. So I would expect a leaderboard with the who’s who of golf come Sunday afternoon. As we’ve seen in the past, this tournament can be won by a short hitter or a bomber, so although hitting fairways will be important, it’s not the be all, end all. I like how Rory is trending and think he’ll be there on the weekend and hopefully duel it out with another big name. I love the venue, so I’ll be sure to be watching the US Open this year, hopefully with my father on Father’s Day! Quinn: I think the new normal on Tour is that all the events, not just the Majors, are wide open. Of course, pundits and odds makers don’t see it that way. DJ is already the favourite at 9-1 in that hockey town in the desert, with lost soul Danny Willett charitably listed at 275-1. It’s just as likely that one of the incredibly talented players ranked lower than the usual suspects will have a career week as it is for one of the household names (not named Eldrick) to play to form. The so-called favourites might make it must-see TV, but I’d still put a couple of ducats on the field. Mumford: Except for last year at Erin Hills, the U.S. Open almost always comes down to which player can make the fewest mistakes. Shinnecock Hills won’t be as brutally unfair as it was in 2004 but it will still be tough and penal, especially if the wind blows hard. That favours players that can vary their ball flight and find fairways. Recovery from the knee deep fescue won’t be an option. Henrik Stenson is ranked #1 in accuracy off the tee and Sergio Garcia, Rickie Fowler and Justin Rose are the only other players in the Top 20 World Rankings within shouting distance of him. I still look for players with lots of major experience and past success to be there on Sunday but erratic drivers won’t be part of that mix. Another first time major winner at The Open?